WASHINGTON, DC – According to a survey conducted by Life Reimagined, in association with Luntz Global, financial security tops the list of changes that would increase one’s happiness. With the New Year in sight, Life Reimagined conducted an online survey to determine the priorities of Americans, ages 40-59. Though the majority of the 1,000 respondents defined their self-worth by their family and relationships, the results emphasized the importance of money and a successful career to a person’s overall happiness. * Financial security tops the list of changes that would most increase happiness (39%), and is the most commonly cited obstacle to prioritizing things that would make people happier (33%). *	When given a choice, 71% of respondents prefer extra money to extra time in the day. * In reflecting on their choices to date, the one thing 21% of respondents wish they had done differently is make smarter financial decisions. Furthermore 12% wish they had pursued a career path with more financial security. What is a Life Budget? The primary goal of the Life Reimagined study was to understand people’s current and ideal “Life Budgets” – how they allocate their time, energy and passion across various areas of their lives. People were able to identify one “budget” that was their reality and another that was their preference, bringing to light the differences between what we want and what we do. Unsurprisingly, one’s aspirations do not always match reality, and this is primarily a result of the pursuit of financial security. * Out of nine designated categories, the average person aged 40-59, budgets 21% of their time, energy, and passion to their job or career. * However, the preference is only 12%, ranking below significant other (23%) and children (18%), and tying with health and wellness (12%). * In contrast, when asked how one derives self-worth, 71% responded family and close friends, while only 29% indicated that their job defined their self-worth. Just in time for the New Year, Life Reimagined offers new, free tools and content, developed by Life Reimagined Institute’s thought leaders, focused on making and keeping resolutions. According to Dr. Christine Whelan, professor of sociology, author and Life Reimagined expert, the reason so many people fail to keep their resolutions is because they are making the wrong ones. With the platform’s two newest programs, Whelan takes a two-step approach, first with “Resolutions in Focus,” which invites users to ask why they want to make a change and ensures that goals are based on one’s values and priorities, not outside influences. Whelan’s second program tackles the next step – now that users know the right resolutions to make, “Complete Your Goal With Self Control,” shares best methods for harnessing the self-control necessary to commit to those resolutions and bring about positive change. While 69% of survey participants responded saying they were satisfied with what they had accomplished in life, the discrepancies between respondents’ actual and ideal “life budgets” indicate that the Life Reimagined community overall would like to make changes to improve their happiness. The central idea of Life Reimagined is the belief that small steps are necessary to bring about change – no matter how easy or difficult, big or small they may seem. With targeted programs and content developed, based on the knowledge gleaned from this survey and years of research and experience coming from the Institute, Life Reimagined continues to uphold its commitment to delivering a one-of-a-kind online experience aimed at guiding people through life transitions and helping them discover new possibilities. Full survey results are available on LifeReimagined.aarp.org/media-kit. Life Reimagined was launched by AARP in 2013 to provide a personal guidance system to help people navigate transitions and live their lives to the fullest. By offering online and offline experiences made up of tools, experts and community, Life Reimagined helps people reflect, evaluate priorities and take action to navigate transitions and new life phases. Learn more at http://lifereimagined.aarp.org. AARP is a nonprofit, nonpartisan organization, with a membership of more than 37 million, that helps people turn their goals and dreams into real possibilities, strengthens communities and fights for the issues that matter most to families such as healthcare, employment and income security, retirement planning, affordable utilities and protection from financial abuse. We advocate for individuals in the marketplace by selecting products and services of high quality and value to carry the AARP name as well as help our members obtain discounts on a wide range of products, travel, and services. A trusted source for lifestyle tips, news and educational information, AARP produces AARP The Magazine, the world’s largest circulation magazine; AARP Bulletin; www.aarp.org; AARP TV & Radio; AARP Books; and AARP en EspaÃ±ol, a Spanish-language website addressing the interests and needs of Hispanics. AARP does not endorse candidates for public office or make contributions to political campaigns or candidates. AARP Foundation is an affiliated charity of AARP that is working to win back opportunity for struggling Americans 50+ by being a force for change on the most serious issues they face today: housing, hunger, income and isolation. AARP has staffed offices in all 50 states, the District of Columbia, Puerto Rico, and the U.S. Virgin Islands. Learn more at www.aarp.org. Women can now download a powerful 78-page e-book to their computers, smartphones or tablets giving them instant access to millions of dollars in available funding. Nationwide (BlackNews.com) â€“ A new e-book has been published, entitled 2015 Grants, Scholarships and More For Women, and it’s everything a woman needs! Listed within the guide are hundreds of real and legit 2015 grant opportunities to start/expand a business or a non-profit organization, and all the scholarships and financial aid opportunities for women to attend college. Why is this book important for women? According to the U.S. Census Bureau, there are more than 158 million women in the United States. There are another 17 million in Canada. But despite such huge numbers, it’s still a man’s world! Women often find themselves greatly disadvantaged just like any other minority group when it comes to equal pay at the workplace, scholarships for education, funding to start a business, public assistance to support themselves and their families. But are grants for real? There are tons of scams out there, but they are also a lot of actual legit grant opportunities! The truth is that thousands of women every year receive grants (directly or indirectly) from various organizations and foundations. These grants are usually funded through individual donations, donations from major corporations, or government funding allocated to a certain cause. Scholarships are also grants, but are only used for education. They are typically given to students to help pay for college tuition, books, and room and boarding. Like grants, they do not need to be repaid! Published by Go Girl Books!, 2015 Grants, Scholarships and More For Women makes it super easyÂ for women of all ages to find the latest grant and scholarship opportunities because every opportunity within the book is real and legit. Even more, it’s already been compiled for easy and instant access. The e-book also features the top organizations for professional & business women, the top magazines/blogs for professional& business women, and the top annual business conferences for… you guessed it, professional & business women! CHICAGO, IL – The week after Christmas when the gift-return season kicks in, can be as hectic as the shopping time before the holiday. To make the effort as easy as possible, consumers should be aware of store return policies. Bernas noted that consumers who were used to having as many as 45 days to return their unwanted gifts now have in some case 30 days or as few as nine days. He also urged consumers to remember that returns are a customer service and are not required by law unless the merchandise is defective. Consumers need to take extra care in understanding the return policies of the stores where they shop, and should not rely only on what they may be told by a sales clerk. They should look for and read the stores written policy, which by law must be displayed. Know the store’s return policy – Read the store’s return policy in the store or online. Do not assume the regular return policy applies to sales or clearance items. Some merchants consider sale items to be final. Have the receipt available – Â Receipts are usually needed for returns and they make the transaction much easier for everyone. Keep the original packaging – Electronics or similar products often require their original packaging when returning the item, so don’t destroy the boxes or throw them out. Know the online return policy – If the item was purchased online, check the online return policy for what is needed when making the return. Â Â Â Often, online purchases come with preprinted return forms. Ask the gift giver if these exist. Returns are a courtesy, so be courteous – Many people are returning gifts, so remember that it can be a trying time for both the returners and the store personnel. And do not assume you have the right to return or exchange an unwanted present. Understand unusual policies – Your gift may have special requirements, such as health regulations, that can prohibit the return of certain items like hats and intimate apparel. Consumers also should be aware that stores are on the lookout for fraud in the return process. Billions of dollars are lost due to return fraud. Many stores take additional steps to track customer returns and catch fraudulent or excessive returns. Because of these actions, customers may be asked for a driver’s license or some other government issued identification when returning an item. Find out more on Christmas returns by visitingÂ bbb.org and for the latest, check out our blog, like us on Facebook or follow us on Twitter. WASHINGTON, DC â€” In this weekâ€™s address, President Barack Obama and First Lady Michelle Obama wished Americans a Merry Christmas and Happy Holidays, and thanked our brave troops for their service. Especially as our combat mission in Afghanistan comes to a responsible end in the coming days, we are reminded of all that military men, women, and families sacrifice to keep us safe. The President and First Lady asked everyone to take some time this holiday season to visit JoiningForces.gov and find out how to give back to the men and women in uniform who have given so much for all of us. The audio of the address and video of the address will be available online at www.whitehouse.gov at 6:00 a.m. ET, December 25, 2014. THE PRESIDENT: Merry Christmas everybody!Â Now, weâ€™re not going to take much of your time because today is about family and being together with the ones you love.Â And luckily for me, that means I get a little help on the weekly address, too. THE FIRST LADY:Â The holidays at the White House are such a wonderful time of year. We fill the halls with decorations, Christmas trees, and carolers â€“ and this year, we invited more than 65,000 people to join us. Our theme was â€œA Childrenâ€™s Winter Wonderlandâ€ â€“ and Americans young and old had a chance to come together and celebrate the season. THE PRESIDENT: And today, our family will join millions across the country in celebrating the birth of Jesus â€“ the birth not just of a baby in a manger, but of a message that has changed the world: to reach out to the sick; the hungry; the troubled; and above all else, to love one another as we would be lovedÂ ourselves. THE FIRST LADY: We hope that this holiday season will be a chance for us to live out that messageâ€”to bridge our differences and lift up our families, friends, and neighborsâ€¦ and to reconnect with the values that bind us together. And as a country, that also means celebrating and honoring those who have served and sacrificed for all of usâ€”our troops, veterans, and their families. THE PRESIDENT: In just a few days, our combat mission in Afghanistan will be over.Â Our longest war will come to a responsible end.Â And that gives us an opportunity to step back and reflect upon all that these families have given us.Â Weâ€™re able to gather with family and friends because our troops are willing to hug theirs goodbye and step forward to serve.Â After a long day, we can come home because theyâ€™re willing to leave theirÂ familiesÂ and deploy.Â We can celebrate the holidays because theyâ€™re willing to miss their own. THE FIRST LADY: And so, as our troops continue to transition back homeâ€”back to our businesses, our schools, our congregations, and our communitiesâ€”itâ€™s up to all of us to serve them as well as they have served us. You can visit JoiningForces.gov to find out how you can honor and support the troops, veterans, and military families in your communities. Thatâ€™s something we can do not only during the holiday season, but all year round. THE PRESIDENT: So Merry Christmas, everybody.Â May God bless you all.Â And we wish youÂ and your familyÂ a happy and healthy 2015. New York, NY (BlackNews.com) — Bravo Media’s “Thicker Than Water” season two will premiere on Sunday, January 4 at 9 PM ET/PT. Season two features the unpredictable Tankard clan as they continue to live their lives as best as they can with their strong religious convictions at hand. 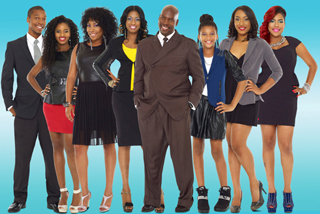 Ben and Jewel Tankard are back, leading their self-proclaimed “Black Brady Bunch” family with children Brooklyn, Britney, Benji, and Cyrene. Joining the family in the “Tankard Palace” is Bens oldest son, Marcus, who returns to Tennessee with his wife, Tish, to a warm welcome from everyone – except Britney.Beginning Monday, January 5 through Friday, January 9, fans can join the Tankard Family throughout the week for a series of live Facebook Q&As on the Thicker Than Water Facebook Page. Viewers will get the inside scoop on the family, the drama and what to expect from the upcoming season. Preacher and patriarch Ben celebrates a year of milestones this season as he turns 50 and his 25th anniversary in music is fast approaching. At the same time, he deals with the twists and turns that come with fatherhood. The real ruler of the household, Jewel, faces what the kids are calling a midlife crisis as she copes with her golden girl and youngest, Cyrene, leaving for college and a rift with her sister that threatens to divide the family. The eldest daughter of the Tankard clan, Brooklyn, finallycomes into her own as an entrepreneur, channeling big ideas into money-making opportunities and taking the hair industry by storm. “Thicker Than Water” is produced by Sirens Media with Rebecca Toth Diefenbach, Valerie Haselton Drescher and Lucilla DAgostino serving as Executive Producers and John Doe Productions with Renard Young and Darren Toon serving as Executive Producers. Bravo is a program service of NBCUniversal Cable Entertainment, a division of NBCUniversal, one of the worlds leading media and entertainment companies in the development, production, and marketing of entertainment, news, and information to a global audience. Bravo has been an NBCUniversal cable network since December 2002 and was the first television service dedicated to film and the performing arts when it launched in December 1980. For more information, visit www.BravoTV.com. Follow them on Twitter at www.twitter.com/BravoPR. CHICAGO, IL â€”The Dance Center of Columbia College Chicago is participating in Urban Bush Womenâ€™s 30th anniversary celebration, presenting the company in a return engagement of new and popular works March 19â€“21, 2015 at The Dance Center, 1306 S. Michigan Ave., Chicago. Artistic Director Jawole Willa Jo Zollar brings the most recent installment of her suite of dances Walking with â€™Trane, based on the music and legacy of jazz pioneer John Coltrane. Chapter 2 is inspired by the making of and the music from Coltraneâ€™s 1965 album A Love Supreme, set to an original, reimagined score composed and performed live by Grammy Award-winning pianist George Caldwell. Caldwell also accompanies Zollarâ€™s Hep Hep Sweet Sweet, a personal memoir of her upbringing in Kansas City, set in a fictional nightclub and drawing upon the music and culture of the African-American migration from south to north up the Mississippi. Also on the program is guest choreographer Nora Chipaumireâ€™s dark swan, an interrogation of how we present and represent African female bodies. In 2014, The Dance Center was the sole Chicago recipient of a 2014 Exploration grant, through the Doris Duke Charitable Foundationâ€™s Building Demand for the Arts program, to work with Zollar to find ways to connect with jazz audiences and artists; Columbia College Chicago dance, music and theatre students and faculty; and students and artists in other disciplines to cultivate new demand for contemporary dance and jazz music through explorations of their intersections. Zollar and several UBW dancers have spent several weeks in Chicago to explore these connections prior to the March residency. Urban Bush Women (UBW), founded in 1984 under the direction of choreographer Jawole Willa Jo Zollar, brings the untoldÂ and under-told histories and stories of disenfranchised people to light through dance. With a woman-centered perspective, and as members of the African Diaspora community, UBW seeks to create a more equitable balance of power in the dance world and beyond. A post-performance conversation with the artists takes place Thursday, March 19, and a pre-performance talk with Zollar takes place Saturday, March 21 at 7 p.m., both free to ticket holders. Company dancers will participate in The Dance Center’s FREE DanceMakers series, which features contemporary dance artists offering insight into their choreographic process, Monday, March 16, 6:30â€“8:30 p.m. at the American Rhythm Center, Fine Arts Building, 410 S. Michigan Avenue, 3rd floor, Chicago. Preregistration is required. The Dance Centerâ€™s presentation of Urban Bush Women is funded, in part, by the National Endowment for the Arts. Additional funding is provided by the New England Foundation for the Artsâ€™ National Dance Project, with lead funding from the Doris Duke Charitable Foundation and The Andrew Mellon Foundation, with additional support from the National Endowment for the Arts. Saying that the mayorâ€™s controversial red light system is flawed because it allegedly is based on revenue versus safety, Ald. Bob Fioretti (2nd) and activist Mark Wallace Monday called for the program to be terminated. And, he said the speed light program is no better and that is too should end. Fioretti introduced an ordinance into the City Council that if passed would end the red light program on April 15, 2015. At a press conference at City Hall, Fioretti said there is no evidence proving that these cameras are effective in preventing accidents. He pointed to a recent Tribune investigation led by Dominique Lord, an associate professor at the Texas A&M Universityâ€™s Zachry Department of Civil Engineering, who concluded that the cameras do not reduce injury-related crashes overall. The study concluded that at some locations, they significantly increased the number of rear-end crashes Fioretti and Wallace blame on the yellow lightâ€™s short timing. Wallace said the yellow lights in Chicago are allegedly one second shorter than other places. While the city claims the red light system has resulted in a 47 percent reduction in right-angle crashes at intersections having the red light cameras, Fioretti pointed to the cityâ€™s own Officer of Inspector general and its audit as proof the programâ€™s failure. The alderman and Wallace said there has been no solid proof that the program works but they agree it has raked in millions of dollars into the cityâ€™s coffers. And, Fioretti pointed to the corruption linked to the red light program. He was referring Karen Finley, one of several Redflex officials fired during the scandal and who was indicted on charges that she and a key City Hall official plotted to fix the camera program.Â Fioretti said it was born into corruption and that it should be lights out for this program. Nashville, TN (BlackNews.com) — The Black Science Fiction Society (BSFS), a collaboration of talented and diverse fiction authors from around the globe, has just released 8 new science fiction novels written by different African American authors. The books have already been heralded as classic stories of imagination. The titles include Afrofuturism by Ytasha L. Womack, American Specter: The Seven Sisters by Rasheedah Prioleau, Broken Glass by Thaddeus Howze, COG by K. Ceres Wright, Conception: Volume 2 of the Darkside Trilogy by William Hayashi, Genesis a compilation edited by Jarvis Sheffield, Silenced by Nicole Givens Kurtz, and Subject 82-42 by Ronald T. Jones. These authors, all incredibly talented, are recognized and award-winning veteran writers. They come from different parts of the country, including New York, Chicago, and Nashville, but are working together to promote their books. Jarvis Sheffield, M. Ed., founder of the Black Science Fiction Society and also editor of one of the books, comments, We have proven that by working together, we can accomplish great things. He adds, We think that it is essential for characters of all colors and creeds to be represented positively and fairly. Given that, this movement is not exclusive to Black People, it is for all people but with a Black focus. We welcome all races and ethnicities to sample works from our top creative minds with The Future of Fiction. Founded in 2008, The Black Science Fiction Society aims to showcase new and interesting literature that is edifying to the soul of readers. Via their online community, members are provided avenues to unapologetically share and showcase their thoughts, dreams and aspirations. Their ultimate goal is to create, highlight, celebrate and develop Black science fiction, speculative fiction, fantasy and horror. Â·Â Â Â Â Â Â Â Â Bring all pets indoors.Â All dogs and cats, whether acclimated to outdoor living, must be brought indoors during sub-zero weather. Even creatures of the wild seek shelter when temperatures plummet. As the responsible caregiver of a pet, you should provide an indoor heated shelter for your animal. Despite their abundance of hair, all domesticated dogs and cats are subject to frostbite and hypothermia. Â·Â Â Â Â Â Â Â Â Salt and ice. Both salt and ice can irritate your dogâ€™s footpads. If your dog will tolerate them, foot coverings are advised. If your dog will not tolerate foot coverings, avoid the salt when possible and wash their paws with warm water when you return home.Â Walking the dog in the snow as opposed to the salted sidewalk may be advisable, but in extreme low temperatures this could add to frostbite concerns. Â·Â Â Â Â Â Â Â Â Frostbite. Dogs and cats may have fur coats but they also have exposed areas that are susceptible to frostbite. Limit their time outdoors for waste elimination only. Walks should not exceed 10 minutes in sub-zero temperatures. Check their pads when you get home and wash with warm (not hot) moist towels.Â If you suspect frostbite on any extremity (donâ€™t forget the nose or the tips of the ears) contact your veterinarian. Â·Â Â Â Â Â Â Â Â Properly secure potentially poisonous material, such as antifreeze. Antifreeze is extremely toxic to all living creatures. It is sweet to the taste but even a drop can be lethal. Keep antifreeze bottles out of the reach of animals and clean up all antifreeze spills immediately. Feral cats and wild animals will seek refuge and warmth wherever they can, Dr. Alexander said. A carâ€™s engine, for example, may provide a warm spot to â€œhole upâ€ in sub-zero conditions. Â·Â Â Â Â Â Â Â Â No treats from the table: There are many food items consumed by humans that may prove toxic to animals.Â No chocolate, stuffing containing sage, grapes or raisins should be given to any pets. Â·Â Â Â Â Â Â Â Â Keep Christmas decorations safe: Tinsel and poinsettias can be toxic.Â If you are able, elevate your Christmas decorations above the grasp of your pet.Â Better yet, surround your tree with animal barricade such as child-proof fencing. Â·Â Â Â Â Â Â Â Â Provide a safe haven for pets: Create a quiet spot for your pets where they can get away from the seasonal merriment.Â Acclimate them to their safe haven by placing familiar smells (blankets, pillows) or toys in the area you have designated.Â When guests arrive, make sure they are aware that this â€œpet secureâ€ area should not be disturbed. Â·Â Â Â Â Â Â Â Â Display rabies tags on collars and secure egress: Dogs and cats can become bewildered by the increase number of holiday guests and often try to escape.Â Remind your guests to close doors when entering or leaving and to secure gates.Â Make sure that your animal is wearing identification in case of escape. Washington, D.C.’s New Diversity Initiative and Hub for Next Gen Animation…Pigmental Studios! Posted by Admin On December - 26 - 2014 Comments Off on Washington, D.C.’s New Diversity Initiative and Hub for Next Gen Animation…Pigmental Studios! Washington, DC (BlackNews.com) The hottest animators in film and television are making Washington, D.C. their home with the arrival of Pigmental Studios, an animation studio that employs the top artists and technologists to produce groundbreaking new works for the entertainment industry. Martins will announce Tuesday – at the Washington, DC Economic Partnership Driving Change 2014 conference – the talented group of artists who will be joining Pigmental in the District. They include Iain McCaig (Harry Potter, Terminator 2, Guardians of the Gallaxy), Marjolaine Tremblay (Birdman, Live, Die, Repeat, Hunger Games: Catching Fire), Stephen Platt (Ironman, Oblivion, The Day the Earth Stood Still) and David Krentz (Ant-Man, Guardians of the Galaxy, John Carter). Those films include KONG, which is scheduled for worldwide film release in 2016 and is a co-production with Aquamen Entertainment (China/Korea); an animated feature with Sergio Pablos (Spain), creator of Despicable Me, which is scheduled for release in early 2017; and a third to be announced in spring 2015. The studio holds options on five other well-profiled feature projects and is currently in development on an animated series for television. Martins also noted that Pigmental is currently in discussions for a co-venture with CCTV, the state television broadcaster in China. “Our goals are to appeal to a world audience and to specialize in creating highly marketable and brandable multicultural content with the top talent Hollywood and the United States have to offer,” said Martins. The film projects are only part of the multimillion-dollar initiative that Martins has planned. Pigmental will launch anÂ apprenticeship-training program for individuals interested in animation in the District, which will focus on specific career tracks within the animated media industry as well as provide apprentices access to animation and production mentors. Headshots of Marina Martins and Pierre Bagley are available, as well as the Pigmental Studios logo and the KONG marketing still. For more information, contact Roy Brannon at 214-724-6892 or via email at brannonroy@aol.com or visit www.pigmentalstudios.com. Photo Caption: Pierre Bagley (left), director of the Office of Motion Picture & Television Development for Washington, DC; and Marina Martins (right), co-founder of Pigmental Studios.